Yesterday was a serious reminder that all the games I played back in college are getting a revamp. First, the announcement from Fantasy Flight Games about the impending Fourth Edition of Twilight Imperium. Second, and much more fun for me, was the opportunity to play the recently updated Robo Rally. Where to even start? 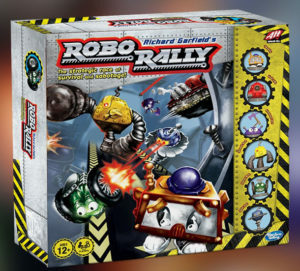 Robo Rally is the chaotic programming game where players try to race their little robots around the factory to reach checkpoints before anyone else. It’s a huge, fun, ridiculous mess and we played it all the time. Were there problems? Absolutely. And instead of telling you what they were, I’ll leave it up to superhuman designer Richard Garfield. As someone with game design aspirations of my own, this really resonated with me. Who wants to look back on something they know they did wrong, simply to look at what they did wrong? Self-forgiveness isn’t easy. Years of teaching, begging students to edit their work and learn from their mistakes taught me that this isn’t easy. So I admire Garfield’s efforts here to look back and fix a well-loved game that could honestly use a fix. 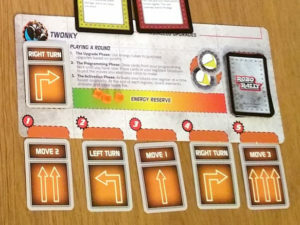 Robo Rally uses a series of programming cards to move around the board. Each turn, you draw nine cards and plan out a series of five register moves. When each player is done, everyone flips over their first register card, performing them in order. Sometimes, that means you step into another robot’s way unintentionally, and it pushes you into an unplanned spot. Other times, the board zips you around on a conveyor or crushes you in cannery row. Even in a perfect world, players can mismanage their program and end up in a totally weird place. Then it’s time to flip over the second card, and chaos gets magnified. Twonky’s brand new player board! Of course, in the old version, everyone drew from the same deck. Which meant it was possible to draw nine left turns. Knowing this was not fun, Garfield redesigned the game so all players had their own deck. Fans of deckbuilders will instantly recognize how this affects game probabilities. Since every deck has the same set of cards, hands of nine become more predictable. Sure, I may not always get a Move 3, but I can be all-but-certain that my hand will contain forward motion. In the old game, that wasn’t quite a safe bet. Individual decks also allowed Garfield to update the damage system. In the old game, players might have one of their registers lock, meaning that the card they had in that particular register phase could stay there for turns and turns on end. Otherwise, damage just reduced the number of cards you could draw, making it even more likely that your turns would be entirely out of your control. The counter was to Shut Down, removing all damage by skipping your turn. Skipping a turn is, unfortunately, not fun. However, in the time since then, we’ve seen plenty of deckbuilders introduce a variation on Curse or Waste cards. These useless filler cards just waste a bit of your time and make this turn a little tougher. Garfield used this idea to add Spam cards rather than damage. These feel like something a robot would hate, and allows for variations like Virus Spam or Trojan Horses, making what would otherwise be a simple damage counter into an interesting series of choices. Reading the rundown of what Richard Garfield changed in Robo Rally is an opportunity to watch a master at work. I absolutely recommend that you check it out, and if you were a fan of the old game, try out the new one and see how it plays! It feels streamlined, simplified, and actually plays like the programatic robot combat racing game I’d always hoped to play.